Multitasking has always been among key features of Windows OS and the one that influences users’ decision when opting to go with Windows PC. Microsoft has further polished this feature in its latest Windows 10 operating systems that now enables you to setup multiple desktops on desktops/laptops. 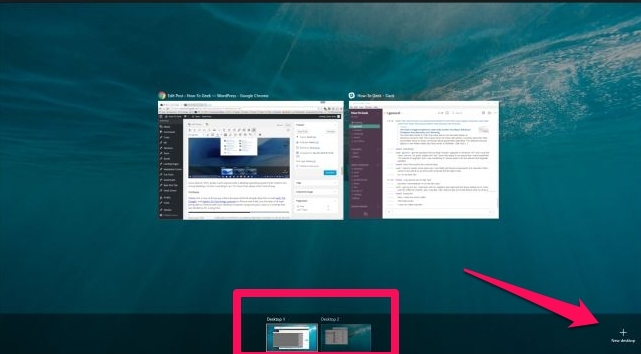 With multiple desktops on Windows 10 you can divide screen into two desktops and carry out completely unrelated work projects on one PC without mixing things up. What Windows 10 multiple desktops do is they isolate programs in distinct assortments keeping stuff related to one task separate from the other task enabling you to work on two different assignments on two desktop screen on one PC Windows 10 desktop/laptop. Follow the guide below to know how to setup multiple virtual desktops on Windows 10. 1 – Click Task View icon on the taskbar, if its not showing then right-click on the taskbar and click on show Task View button option from the list. 2 – Now click new desktop button on the bottom right corner of the desktop screen. 3 – It will create a new desktop along with the one you are using currently. Open programs, apps and do stuff like on normal Window screen. 4 – To quickly switch between multiple desktops hit Windows + Tab keys. 5 – You can open or drag and drop apps from one desktop to another. 6 – If you want to create a new desktop quickly then press Windows key + Ctrl + D. For closing current desktop screen to go back to the original one press Windows Key+ Ctrl + F4. To toggle among various desktop screens press Windows key + Ctrl + Left/Right arrow key. All done. It is easy to create and use multiple desktops on Windows 10 PC/laptops to perform work and personal tasks on different screens without creating a clutter of open apps and programs on one desktop.